The Geelong Carlton Hotel has received council approval for a $120 million redevelopment and transformation of the historic building. Woods Bagot design will see heritage elements of the 1884-built hotel, including its art deco brick façade, retained amidst a nine-storey contemporary addition. According to Architecture and Design the approved plans show that nearly 18,000 square metres of commercial space will be delivered across a nine-storey tower with uninterrupted window access on all four perimeters. The tower and its podium will be set back from the existing foot print of the Carlton Hotel to create a plaza-style entrance to the new building. 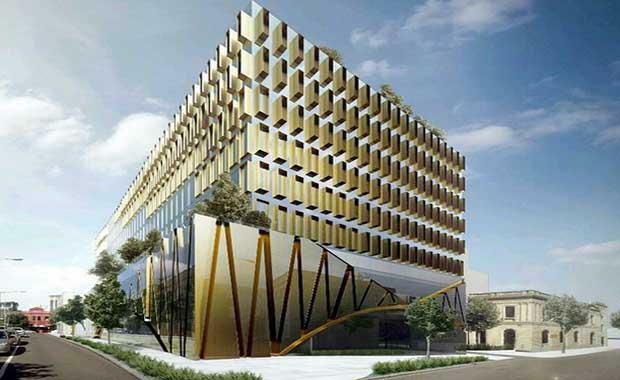 A fritted double glazed curtain wall rises from a two-storey podium to the rooftop plant level and is punctured only by sun oriented gold anodised aluminium shrouds. The podium is also wrapped in a combination of clear and gold coloured fritted glazing but will feature a pattern of curving gold aluminium mullions. The roof top plant level will be setback to incorporate a terrace for tenants and will be covered by bronze anodised aluminium louvres and vegetation. According to Architecture and Design the building complies to 5 Star NABERS and Commonwealth and State Government building specifications and includes plans for a cafe and other amenities as well as three levels of basement car-parking. Techne Development who have committed to helping the Council upgrade the surrounding streetscape which will include tree-lining Malop Street and enhancing the public amenity including new lighting, landscaping, street furniture and public art.